Three concerns have remained constant in my approach to painting: the exploration of process, color and space. What excites me is the continual search for new relationships between color, space, form and surface. My painting career began in the shadow of the Abstract Expressionists for whom process was paramount. This is true in my work as well since my compositions are not pre-determined. I build up my paintings through more than 100 layers in a slow, obsessive, painstaking way. Each thin layer of acrylic is created from numerous small brush marks. By alternately sanding and applying additional layers of color, the forms and edges begin to appear, then gradually change and, finally, assume their placement within the compositional whole. Of primary interest to me during the painting process is the use of color. The placement of one color in relationship to another alters the perception of their value and hue. Those normally thought of as bright and light may become dark or less intense by virtue of their relationship to surrounding colors. 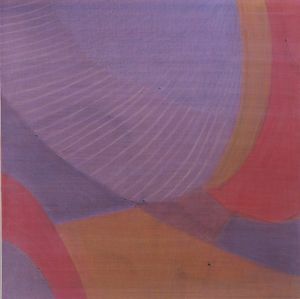 In addition, the use of iridescent and interference pigments leads to the perception of color shifts as a result of the changing physical position of the viewer. My interest in the depiction of space developed through study of European and Asian artistic tradition. I am not only sensitive to relationships between negative and positive space, but also to variations in scale and types of edges. Great spatial effects may also be achieved through color relationships with virtually no value change from color to color. 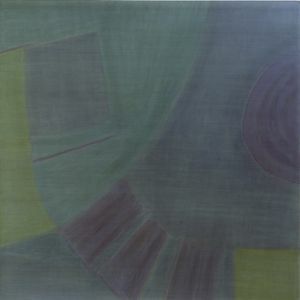 Selma Moskowitz is a painter and educator. After first obtaining a BA in Art from the University of California, Berkeley, she went on to earn both an MA and MFA from the University of California, Los Angeles. She was also awarded a National Scholarship to the Art Students League in New York City and a Mabel Wilson Richards Fellowship from University of California, Los Angeles. 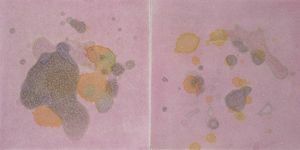 Moskowitz has had solo shows at numerous venues including Jan Baum Gallery, Jacqueline Anhalt Gallery and Mount St. Mary’s College in Los Angeles; University of California, Santa Cruz; and Davis and Cline Gallery, Ashland, OR. 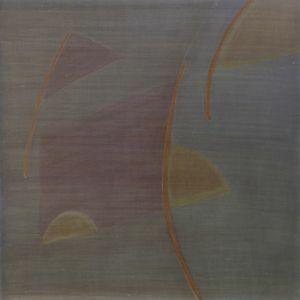 Her work has been shown in many group exhibitions nationally, most notably The Early 60’s at UCLA at the Dickson Art Center, University of California, Los Angeles; Generation of Mentors at the National Museum of Women in the Arts, Washington, DC. ; and Mark Making at the Schneider Museum, Southern Oregon University, Ashland, OR. She has won art awards from venues such as the Laguna Gloria Art Museum, Austin, TX and New York University, New York City, as well as both a New American Talent and Discovery Award from the Art of California Magazine. Her work has been reviewed in the LA Weekly by art critic Peter Frank and is included in LA Rising: So Cal Artists before 1980, by Lyn Kienholz. It is featured in various collections, including Mt. St. Mary’s College, Los Angeles; UCLA Faculty Club and Neuropsychiatric Institute, Los Angeles; United Kingdom Mission to the United Nations, New York City; and numerous private collections. Moskowitz has also had an active teaching career. From 1968-1983, she was head of the art department at Oakwood Secondary School, North Hollywood, California. In addition, she has taught classes at California State University, Los Angeles; UCLA Extension, Los Angeles; University of California, Santa Barbara; and the Los Angeles County Art Museum, CA.